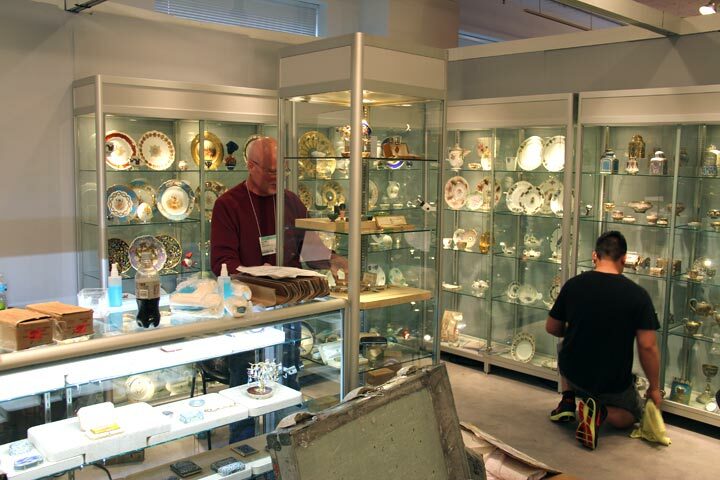 Setup went well at the Merchandise Mart International Antiques Fair. We doubled the size of our booth, so we had lots of space to properly exhibit our special selection of lamps, glass, ceramics and paintings. You’ll have to come in person to see the completed fabulous display. The show is about 10% larger than before, with several exhibitors on the north side of the show floor, where previously there was no one. I walked the entire show and was blown away by what I saw. I assure you, this is one show you shouldn’t miss. The exhibitions are very high quality and very diverse. Almost everything that could interest you is on display. The show opens to the public this Friday, April 27th at 11 AM. The preview party is tonight, to invited guests. The show is killer, so make sure you come!! Then come to my booth and tell me I was right. Our next show won’t be until July, but we’ll still be very much in business (except for a two week well-deserved vacation). Don’t hesitate to call or write, and let me know what you’d like to buy, sell, or trade. 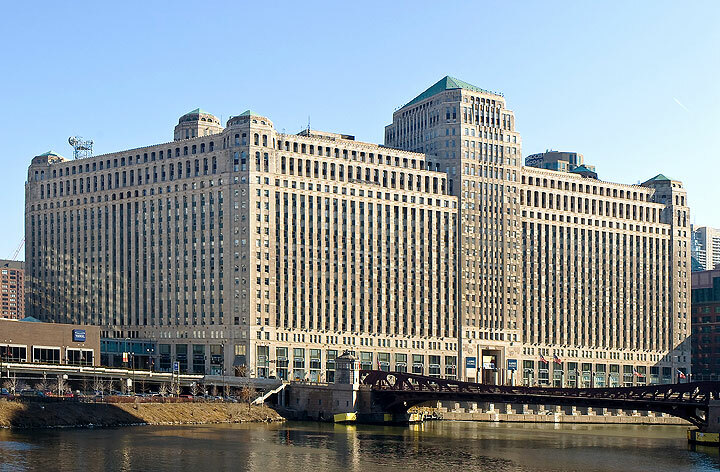 The Chicago Merchandise Mart is located downtown, on the river, a few blocks from Michigan Ave. 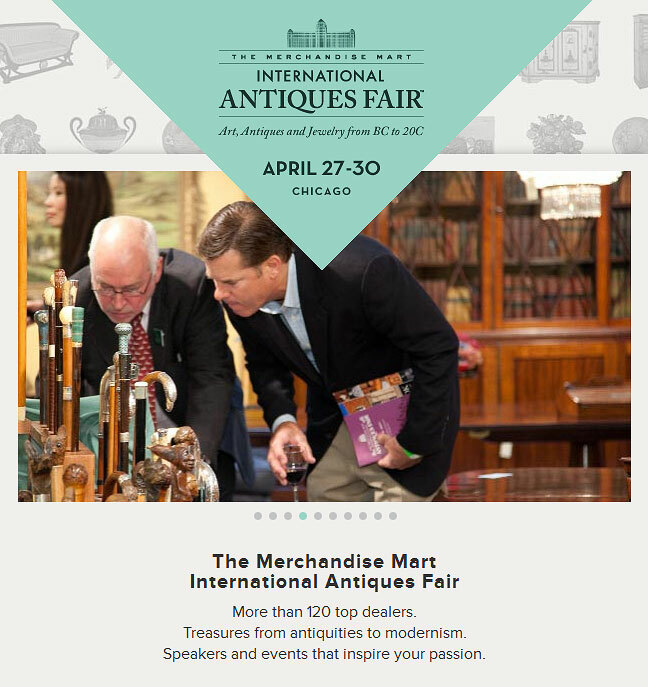 The Chicago Merchandise Mart International Antiques Fair opens this Friday, April 27th at 11 AM, and continues until Monday, April 30th, at 3 PM. 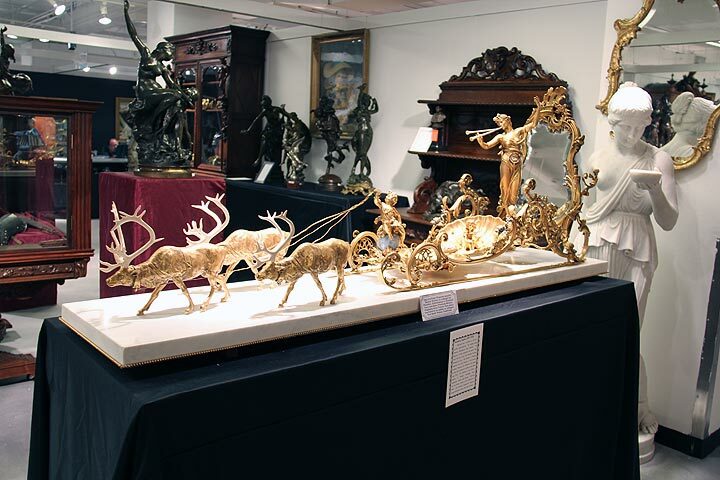 It’s Chicago’s best antiques show and one of the best in the entire country. The quality is very high throughout, with many of the exhibitors displaying at very few shows. Some of them will travel from around the world to exhibit at this show. It’s an opportunity to see amazing exhibitions that exceed the quality and breadth of many museum’s collections. 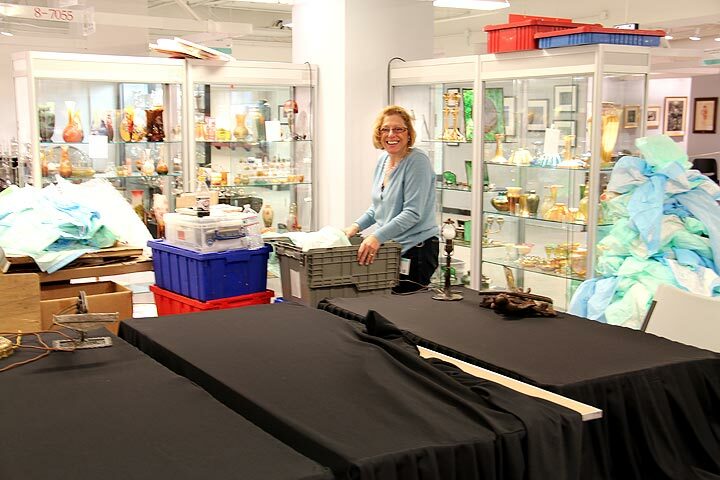 The Rehabilitation Institute of Chicago will benefit from the preview party on Thursday night, April 26th. They treat people with a variety of diseases ranging from cerebral palsy and spinal cord injury to arthritis and chronic pain. Most of you know I’m not a fan of preview parties, but this one is a cut above many of the others. The Merchandise Mart treats its dealers well, unlike some other promoters. There’s plenty of food and drink for everyone. All you get at some other shows is a clear plastic box with a half sandwich, a cookie and a few grapes. I’m not joking and I’m not exaggerating. It’s shameful. 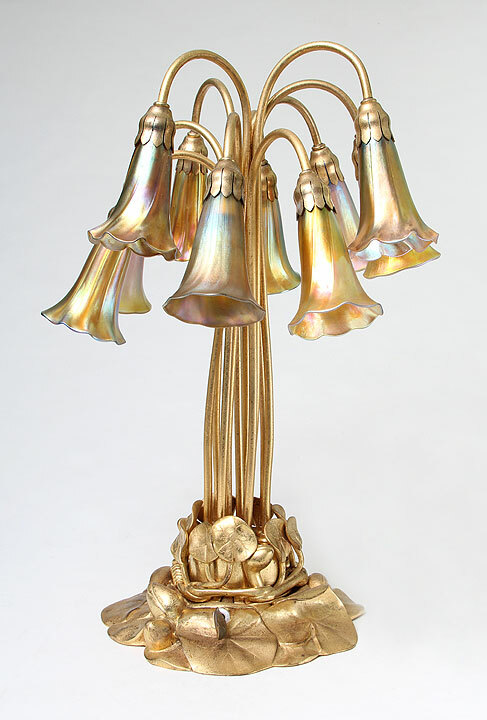 I’m bringing a fantastic assortment of Tiffany Studios lamps and glass, French cameo glass by Daum Nancy and Emile Gallé, stoneware by the Martin Brothers, superb American illustrator paintings and a large collection of Louis Icart etchings, including some very rare ones. The show is worth a trip from anywhere, so walk, drive, fly, or do whatever it takes to visit. Chicago weather at this time of year is usually fantastic, with tulips in bloom on Michigan Avenue, although they may be finished this year because of unusually warm weather in March. 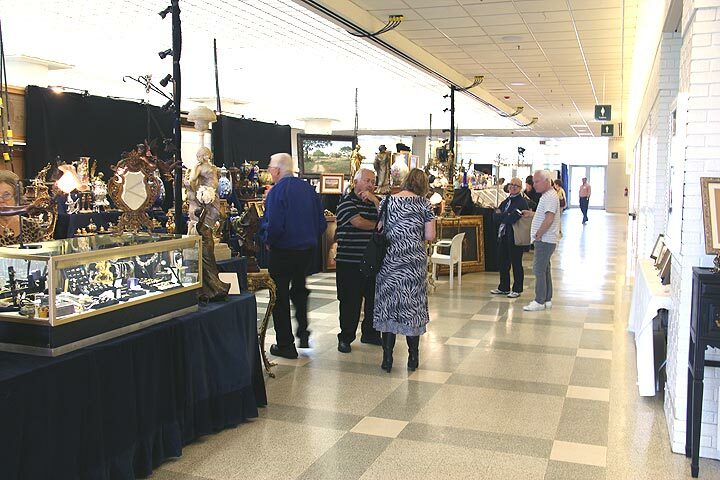 The Arlington Park Racetrack Antiques Show was held in Arlington Heights, IL, from April 13-15, 2012. Unfortunately, the show has gotten smaller and smaller over the years and has been in a vicious cycle. There were fewer dealers, so there were fewer people. Some dealers didn’t do well and won’t come back, and round and round it goes. It’s possible to reverse a vicious cycle, but it takes extraordinary effort and money. A show promoter has to commit to a show and pour money into promotion to attract new dealers and new attendees. It’s been done before. The problem is that the show promoter, Shawn Hastings, has been very ill for quite some time, so he wasn’t able to do what needed to be done. Hopefully, he’ll do something now and reverse the trend. Personally, my show went well. Thanks to a very loyal customer base in the greater Chicago area, the right clients showed up and made purchases. (You know who you are, so I’d like to send each of you a personal thank you.) There was interest in a variety of areas, including French cameo glass by Daum and Galle, Tiffany desk items, and American Art Pottery. Icarts, paintings, and lamps were slow at this show, but unpredictability is why I made a conscious decision many years ago to diversify. Everything that didn’t sell at this show may sell at the next. In asking around, a few dealers did okay and a few were complaining. I didn’t hear anyone rave about his/her show. Attendance was fairly light all weekend, with mostly tire-kickers coming on Sunday. Our next show will be at the Merchandise Mart, in downtown Chicago, Friday-Sunday, April 27-30. It’s Chicago’s best show, and one of the best shows in the entire country. There will be great exhibitors, many of whom exhibit at very few shows a year. It’s worth a trip from anywhere. 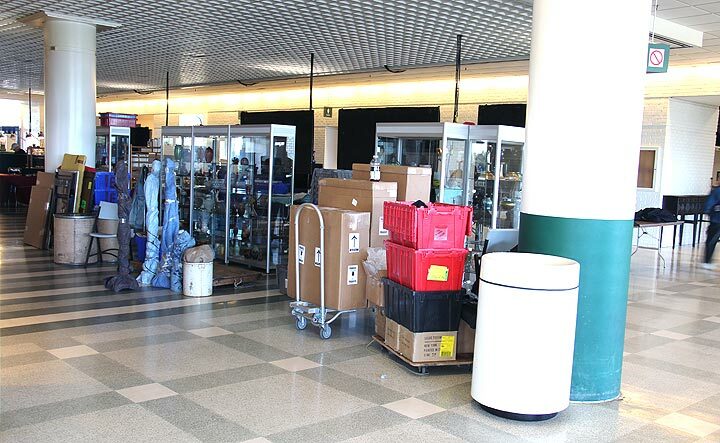 The Arlington Park Racetrack Antiques Show starts this Friday, April 13, 2012, at 11 AM, and continues until Sunday, April 15, 2012, at 5 PM. 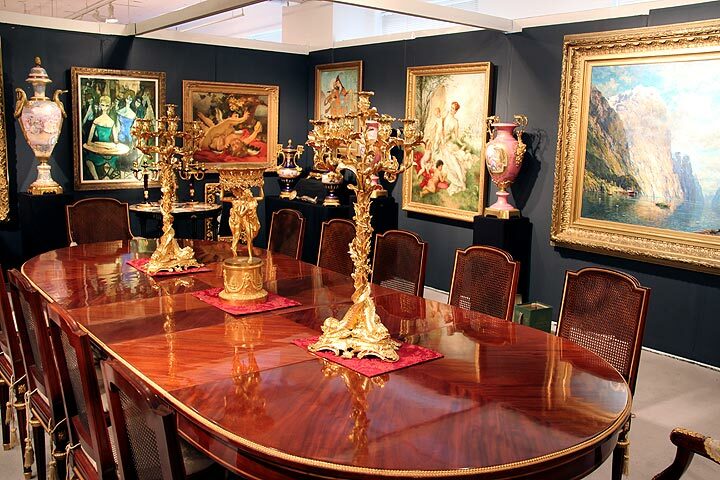 It’s a small, but very nice show, with a diverse selection of quality dealers. We have many friends in the greater Chicago area so it’s a pleasure to return after not having exhibited there since last November. We’ve been doing Chicago shows for so many years that it feels like home. I’ve been buying up a storm, so I’ll be bringing my new purchases, which include Tiffany lamps, glass and metalware, outstanding Daum Nancy and Gallé glass, a Le Verre Francais lizard vase, a nice selection of Martin Bros. stoneware, a wonderful Pairpoint puffy lamp, delightful American illustrator paintings, and a great selection of Icart etchings. 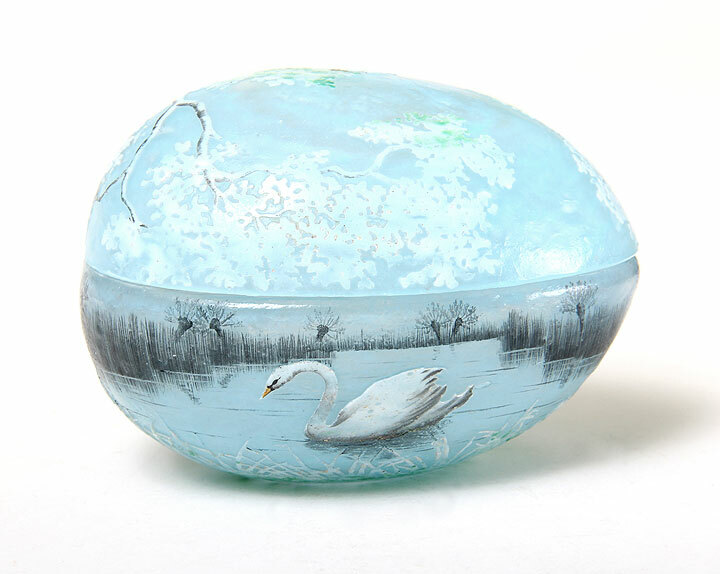 The French cameo glass market has been good, with rare items selling strongly at auction. 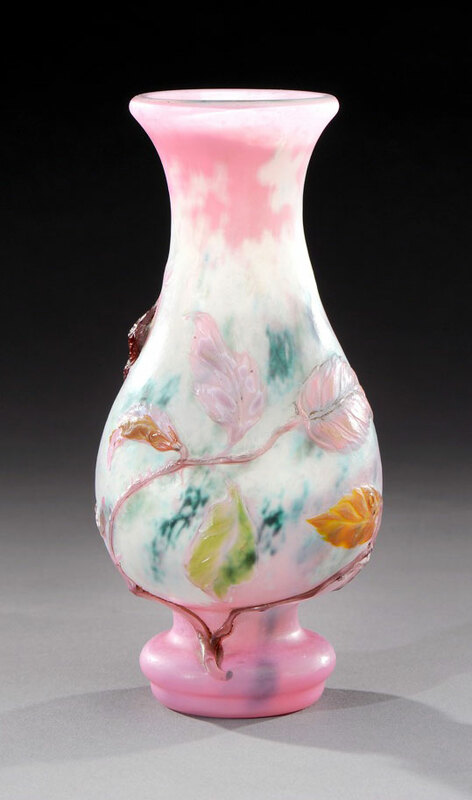 Click on this link to read my blog about the 10″ Daum Nancy blackbird vase that was sold last month at Christie’s for $40,000. Christie’s results blog. 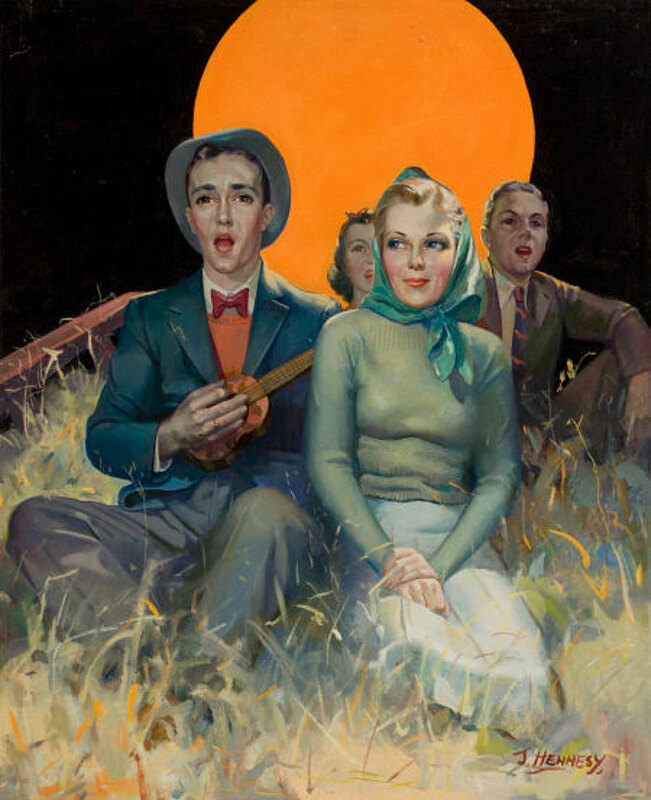 I just bought a group of nine American illustrator paintings, one better than another. I’ll have them all at the show. Have I given you enough reasons yet to visit the show? Make sure to stop by my booth and introduce yourself. I want to know what you’d like to buy, sell or trade. That’s a lot of money for a 7″ vase, so you might ask why. 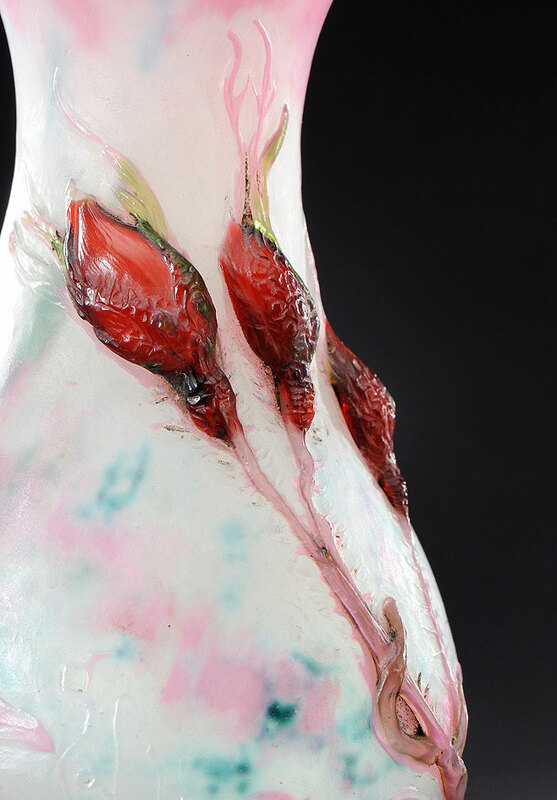 Artistic vases rely heavily on the techniques of application and wheel-carving to create realistic 3-dimensional objects. 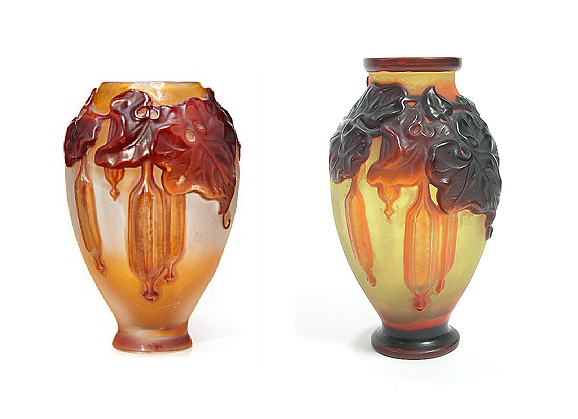 The amount of hand-workmanship and technical prowess necessary to create an artistic vase greatly exceeds that for standard, commercial vases. You want to see some artistic vases? Go find a good museum. It was a rarity for a vase of this quality to be sold at public auction. 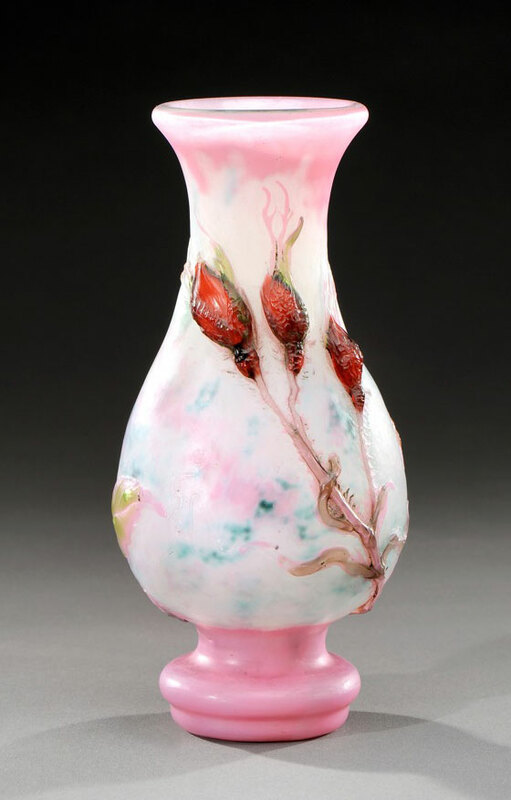 The Gallé Rose de France vase was part of a very limited number of vases in the series. Take a close look at the workmanship in the detail photo. It’s phenomenal. The roses were applied, as well as the stems. All of the detail was hand-carved, with no acid-etching. The background mottling is internal. It’s killer! Not every artistic Gallé vase will sell for $200,000, but this one was special — beautiful, colorful and technically very sophisticated. I knew the price would exceed its conservative estimate, but even I was surprised by the final result. Our next show will be the Arlington Park Racetrack Antiques Show, in Arlington Heights, IL, next week, Friday-Sunday, April 13-15. We always enjoy coming to the greater Chicago area. We’ve got lots of friends there and look forward to seeing them again. Come to the show! There are some great exhibitors and we’ll be bringing an outstanding display. Glass vases are easily damaged. It’s the nature of glass — it’s delicate. So what does one do if a vase gets chipped? Doesn’t make sense to throw it in the garbage, so you get it fixed. Repairs to tiny chips don’t have much of an effect on value. For bigger chips or cracks, a makeover may be necessary, and that will certainly affect value. The vase will still have some value, but that’s a nebulous area. If it’s sold at auction, the discount could be slight or major. And that’s where the problem lies. Sometimes the experts at auction galleries know that a vase has had a major alteration and sometimes they don’t. That puts most of the responsibility on your shoulders. If you know what the shape should be, you’ll notice any alterations. Here are a couple of examples. 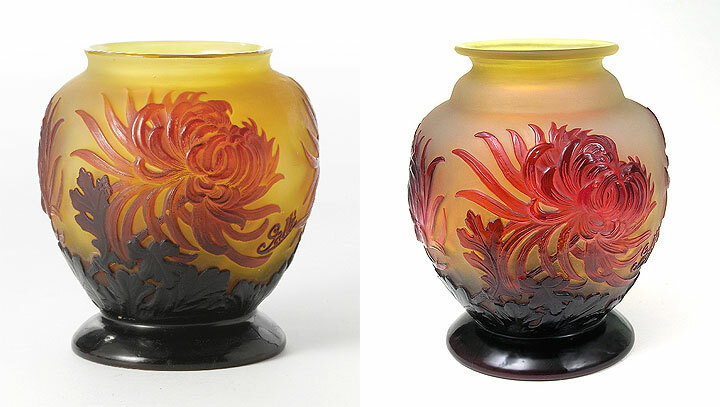 The first is a Gallé chrysanthemum blownout vase that was sold at Sotheby’s New York on March 7, 2012, as lot #211. 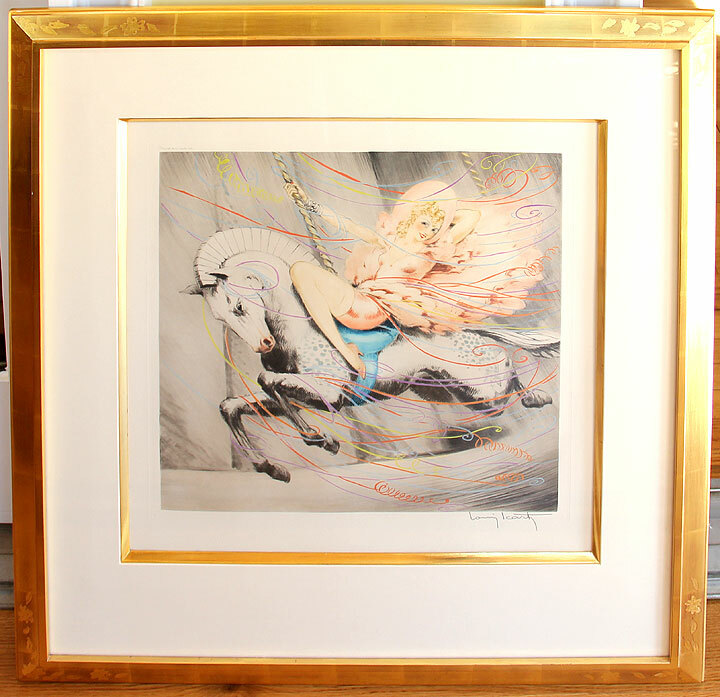 It was estimated at $6,000 – $8,000 and sold for $7,500, including buyer’s premium. Chrysanthemum is a rare model that would have done much better, if it were perfect. As you can see from the photo, a substantial portion of the top of the vase was missing. My guess is that the buyer was unaware of the problem (and will be pretty unhappy if (s)he reads this blog). 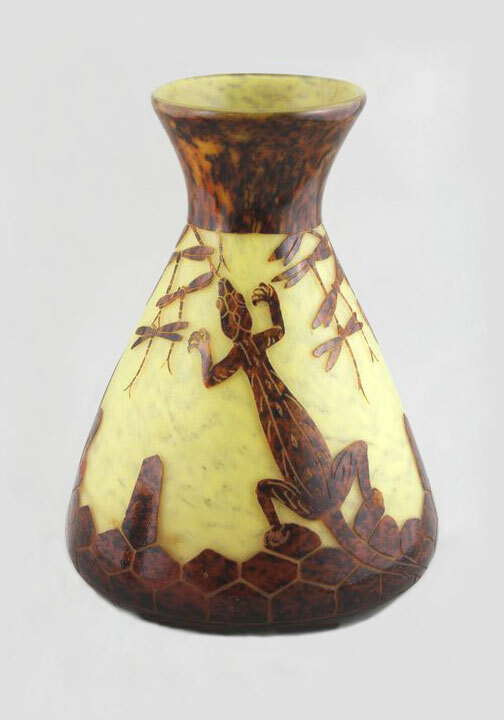 Bonham’s will be selling a Gallé seed pod blownout vase. They know that the top has been cut off, so it’s listed in the catalog as “reduced”, but they apparently don’t know the foot has been “reduced” also. The estimate is conservative at $1,000 – $1,500. 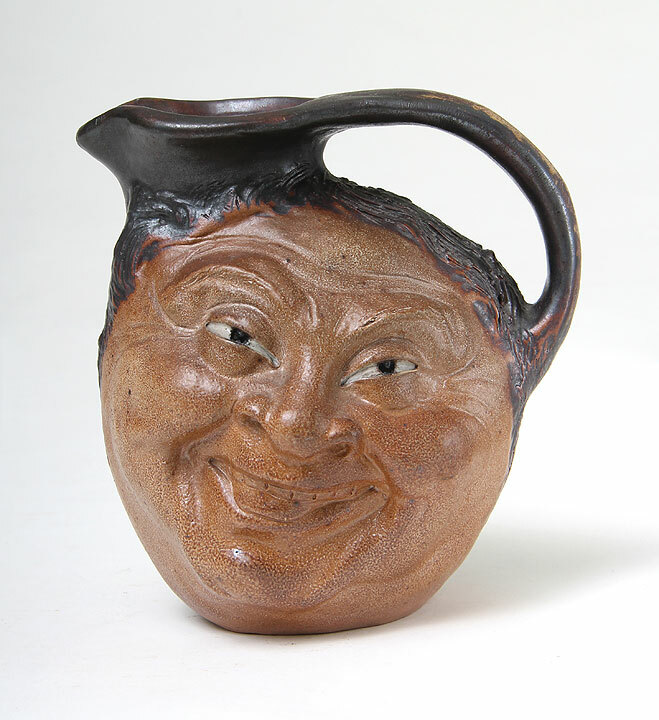 This is a vase that is so problematic, it’s anyone’s guess what it may sell for (and it may not sell, if there’s a reserve). So what is a collector to do? There are only a few choices. The first is to become knowledgeable and learn your shapes. That’s not an easy thing to do, as it takes lots of time and exposure to the vast selection of French cameo glass available. The second is to buy from a dealer who’s knowledgeable and whom you trust. (Hmm, I have a suggestion.) Third, is to deal with reputable auction galleries. Ask for condition reports in advance. Hopefully, the experts in charge will have the knowledge you need. 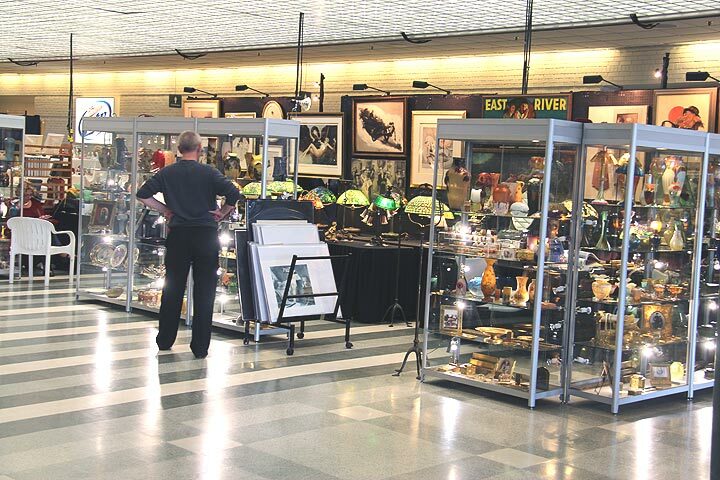 Our next show is the Arlington Park Racetrack Antiques Show, in Arlington Heights, IL, April 13-15. We always enjoy coming to the greater Chicago area. We’ve got lots of friends there and look forward to seeing them again. Come to the show! There are some great exhibitors and we’ll be bringing an outstanding display.